Metrology for the intelligence community; direct-write silver deposition. The semiconductor industry continues to move full speed ahead with traditional chip scaling. There are several challenges in the arena. One of the big but lessor known challenges is metrology. Metrology, the science of characterizing and measuring films and structures, is becoming more complex, challenging and expensive at each node. Looking to solve some major problems in the metrology arena, the Intelligence Advanced Research Projects Activity (IARPA) recently announced an effort to develop metrology tools that could image current and future chips at a faster rate. The program, dubbed the Rapid Analysis of Various Emerging Nano-electronics (RAVEN), is a multi-year research effort to develop a metrology tool for use in failure analysis, process verification and the identification of counterfeit chips. RAVEN also involves four sub-contractors, which are developing separate metrology tools. IARPA is part of the Office of the Director of National Intelligence, which has a mission to lead the integration of the various U.S. intelligence agencies. IARPA is a key research arm for the U.S. intelligence community, which is composed of 17 organizations, such as the Central Intelligence Agency (CIA), the Defense Intelligence Agency (DIA) and the National Security Agency (NSA). IARPA itself invests in high-risk, high-payoff research programs for both the commercial and government sectors. IARPA is working on several programs, including cybersecurity, machine learning, quantum computing and others. The goal of the RAVEN program is to develop a prototype analysis/metrology tool. It is targeted to acquire images and reconstruct them in a 10nm design with up to 13 metal layers. It must do this in an area of 1-centimeter-squared in less than 25 days. “What we are pushing with RAVEN is time, area and also resolution. We want to look at the current state-of-the-art–10nm circuits. We are pushing the teams to have sub-10nm resolution,” said Carl McCants, RAVEN program manager at IARPA, in a recent interview. “The goal is to increase our ability to acquire these images by a minimum factor of 10. We are actually aiming for 100. Then, the software must reconstruct what the chip looks like. This is time-consuming and the technique is also a destructive process. Enter RAVEN. “As semiconductor technology continues to follow Moore’s Law, each new generation of chips has smaller geometries and more transistors. The ability to quickly image advanced chips has become extremely challenging. Maintaining this capability is critical for failure analysis, process manufacturing verification, and identification of counterfeit chips in these latest technologies,” McCants said. The RAVEN program is divided into three phases. There are four IARPA-funded research teams or sub-contractors, which must achieve a set of metrics for time, resolution, accuracy, and repeatability by the end of each phase. The goal is to devise a non-destructive metrology technique. It also requires algorithms for the reconstruction of the integrated circuit at enormous volumes. *A team from the University of Southern California-Information Sciences Institute is working on an X-ray technique called ptychotomography, which is a special tomographic method. Researchers from this group hope to development similar technologies as the Paul Scherrer Institute (PSI), which recently made detailed 3D images of a chip using this non-destructive method at 15nm. *Varioscale, another team member of RAVEN, is working on a different approach. It hopes to combine its CD-SEM and high-resolution delayering technology with Zeiss’ 61-beam microscope. *BAE Systems is also working on X-ray metrology. They are leveraging detectors from NIST using superconductivity. *The Massachusetts Institute of Technology (MIT) is also working on an X-ray based technique. The technology is based on 2D arrays of both X-ray sources and detectors for a lab tool. Each team will develop a technology. One or more technologies may get adopted in the marketplace. The Phase 1 part of the program started in November of last year with a goal of developing a bench top system. The goal of the phase 2 part of the program is to develop an alpha tool. Then, in phase 3, which runs until 2021, the goal is to devise a beta tool. Helmholtz-Zentrum Berlin (HZB) and the Swiss Federal Laboratories for Materials Science and Technology (EMPA) has put a new twist on electron-beam-induced deposition (EBID) technology. 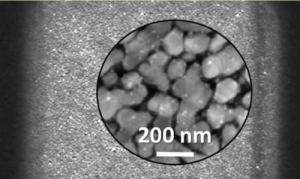 Researchers deposited silver nanocrystals on a surface using EBID. EBID is a direct-write additive fabrication technique. The tool technology is one of several ways to enable selective deposition. Selective deposition involves a process of directly depositing materials and films in exact places. EBID is used for gold, platinum and copper materials, but not silver. 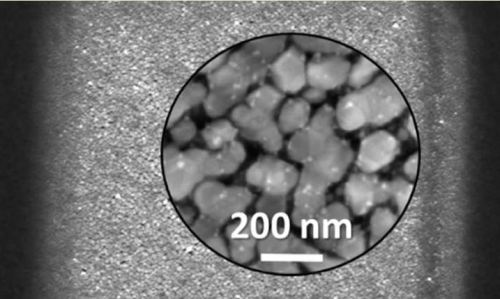 Potential applications for EBID-enabled silver nanostructures are sensors that detect small traces of specific molecules.